This design by CB Two Architects keeps Sixth Avenue open and remodels the old Fire Station 11, right, as a museum. Albany is getting close to picking the designs for its proposed new police headquarters and downtown fire station. Two separate plan-review committees are to make their recommendations to the city council on Nov. 12. And the following night, a special citizens task force on public safety facilities will discuss financing options, including a $20 million bond issue that voters would be asked to approve next May. 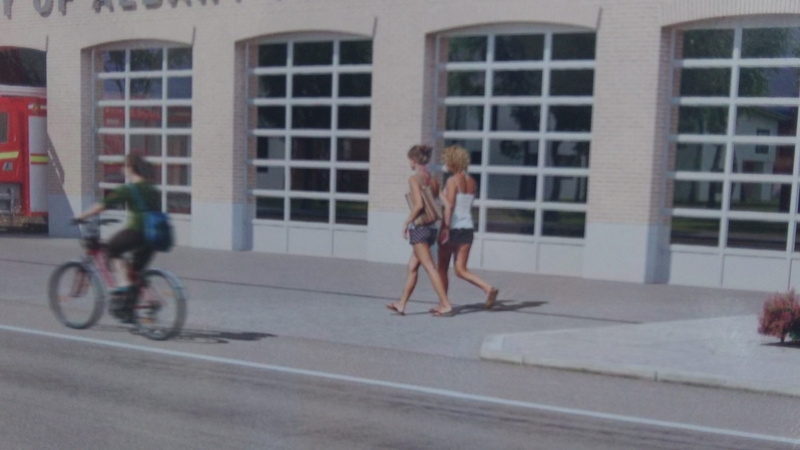 Two of the fire hall proposals are based on closing Sixth at Lyon so the bigger station can be built across it. The third — and most expensive — is by CB Two Architects and keeps Sixth Avenue open. 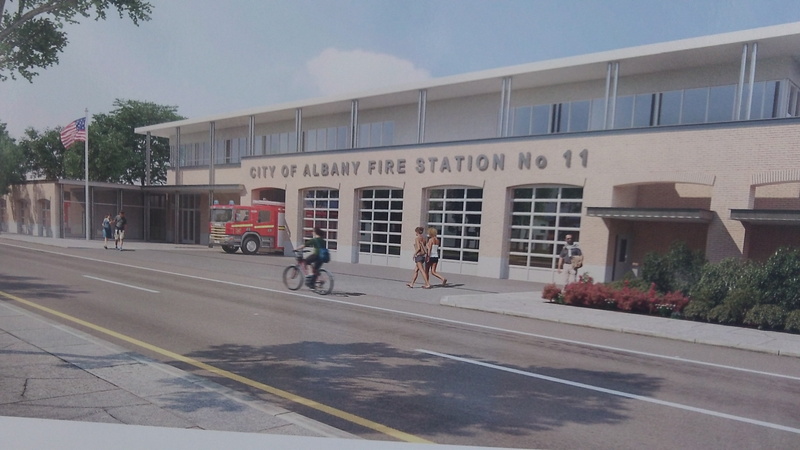 It would remodel the existing Station 11 and use it to house the Albany Fire Museum, now based on 34th Avenue. 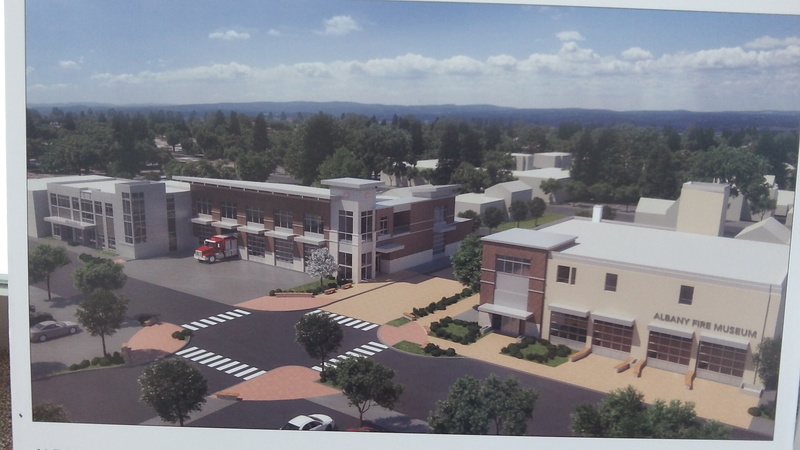 The new Station 11 would be build on the north side of Sixth. 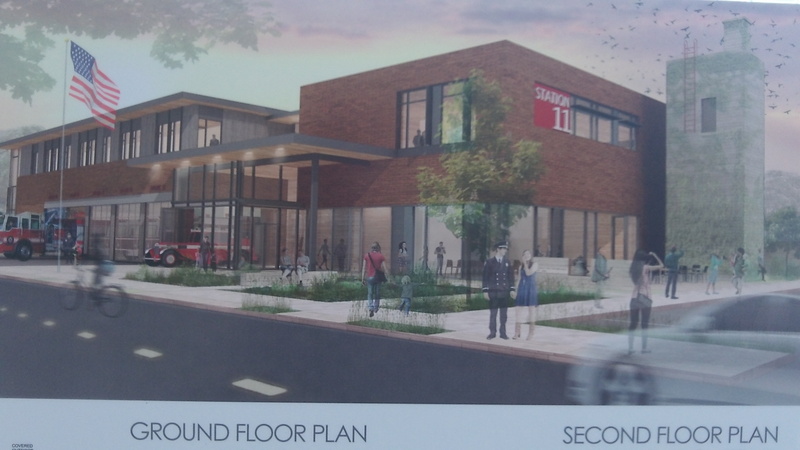 Cost estimates for the Station 11 replacement, including “soft costs,” are $7.5 million for the design by Pack Smiley Ettlin Architects; just under $8 million for a proposal by Mackenzie; and $10.6 million for the concept submitted by CB Two. Together, depending on which plans are picked, costs for the fire station and police headquarters are estimated to range from $21.3 million to $25.6 million. The city council, acting as the Albany urban renewal agency, has agreed to pay $1.4 million toward the combined project from downtown urban renewal funds. The special public safety facilities committee on Nov. 13 will talk about another city contribution from the money left over from Albany’s Pepsi-Gatorade settlement. The committee will also review the possibility of a $20 million bond issue, which would cost a total of $33 million over 20 years and result in an annual tax rate of 37 cents per thousand dollars of assessed value during that time. A rendering of the proposal by a firm called Mackenzie. Peck Smiley Ettlin Architects had this idea of how Station 11 would look. It must be summertime in the Peck architects’ imagination. Why does it have to be both buildings on one bond measure? Why doesn’t the city allow voters (taxpayers) to evaluate the merit of each building through separate bond measures? Forcing voters (taxpayers) to decide, once again, on a high-priced package deal increases the risk that the city will get neither building. Hasso–you state the higher costs associated with keeping 6Ave open. The benefit is to remodel the existing fire station to day-time occupancy earthquake standards thus creating much more sqft space and makes that extra cost be payable with UR money. I’ve rec’d the PS agenda for 13Nov. It omits the possibility of using any of the $5M economic development money. I understand the need for a “newer” fire station, but does it make sense to use the old building for anything if it doesn’t meet “earthquake standards”? That appears to me to be a future “money grab” to “update” it AFTER they get what they want for a new station. It makes NO sense to me to locate a police station further away from the main population of the city. They did the same thing in my home town and then guess what? They needed a sub station to serve that part of the city they abandoned. That’s ANOTHER future money grab. Why note use the old fire station property for a new police station, since the city already owns it. Excellent idea, Bill. Use CARA funds to bring the old fire station building up to earthquake code (seems within CARA guidelines cited by council members when they cited “limitations” on what CARA funds could be allocated under specific criteria, perhaps making far more available from CARA), repurpose that building to police administration while retaining the Jackson St. location as a satellite facility due to it’s proximity to the jail. To spend a bunch of money to upgrade the current fire station only so it can serve as a museum seems a poor use of taxpayer money. Then sell the property on south Pacific. That is NOT a good location for the Albany Police Station for reasons I and others have mentioned before. Apply those funds to the new buildings. Finally, as suggested by many, provide separate bond measures for each project. Let the people decide what we need and when we need it. With the current plan to site the police on south Pacific, it is obvious that more thought must be given to these plans. We are not locked into that site just because the proposals submitted are for that location. That can be changed.